rec. 2–9 September 1950 (Act 2), 11–22 September 1951 (Acts 1 and 3), Musikvereinsaal, Vienna. Mono. I have not heard that Naxos remastering but the mono sound here is very acceptable, despite a bit of hiss and pre-echo. There are so many first rate, vintage recordings of “Die Meistersinger”, dating back to live excerpts conducted by Blech (1926) and complete performances by Bodansky at the Met (1936) and Toscanini (1937), with luminaries such as Friedrich Schorr – arguably the greatest Hans Sachs – and Hans Hermann Nissen respectively. Paul Schöffler, is the Sachs in this 1950-51 studio recording conducted by Hans Knappertsbusch – the first ever made - and he must also surely be counted among the greatest interpreters of that role. 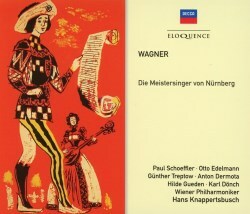 The early 1950’s was a golden age of Wagner voices and 1951 produced a bumper crop of recordings; in addition to this one, there is Karajan’s live composite performance from Bayreuth, starring Otto Edelmann, Kempe’s radio broadcast from the same year with another superb Sachs in Ferdinand Frantz. If you want to hear Knappertsbusch conducting this work, then this recording under review is certainly preferable in sonic terms to his live 1952 Bayreuth performance and for many the earlier cast will have the edge, too. The same is true of his live 1955 performance, from Munich, which is less desirable despite the presence of Lisa Della Casa and Frantz, again in fine form. With so many great singers and conductors turning their attention to this masterwork, it is hard to sift and rank them according to taste and merit; I for one simply revel in them all yet have my preferences, such as for a softer, more naturally sung David of the kind we are given by Anton Dermota here, rather than the hard, nasal – if still very characterful – portrayal by such as Gerhard Unger and Paul Kuen. I also prefer celebrated Tristan Günther Treptow as Walther to the brazen-voiced and ubiquitous Hans Hopf, even if Treptow’s timbre is rather edgy; he has all the notes and does his best to sound the young, ardent lover - which is a stretch for him, despite his being only in his early forties at the time of recording. He is really good, however, in his last delivery of the Prize Song. Indeed, with a silvery, shimmering Hilde Gueden and Edelmann this time singing Pogner, accompanied by a team of highly experienced Viennese regulars, Knappertsbusch’s recording has in many ways a claim to offering the best cast of all, especially when the relaxed flexibility of the conductor’s beat and the virtuosity of the VPO are counted in the mix. Edelmann’s noble bass is perhaps ultimately better suited to Pogner than Sachs and Harald Prögelhöf doubles as Hermann Ortel and the Nightwatchman; his clean bass is lighter than I would prefer for the latter but he sings beautifully. Perhaps it is a rather crude approach, but I am fond of using the famous Quintet as a means of discriminating between recordings, simply because this sublime ensemble lies at the heart of the music and is inevitably a highlight. Certainly it is beautifully sung and paced here, but the voices do not blend as seamlessly as the very best: Gueden is a little “keck” compared with purer-voiced sopranos such as Della Casa and Grümmer, Treptow a tad harsh of tone and the strings rather piercing. Otherwise, Treptow is, as I say above, generally fine if rather mature, as is the Magdalene, fruity contralto Else Schürhoff. Schoeffler is warm, avuncular and very expressive in his monologues and his top E and F are still intact if not exactly full and fresh. His duets with Gueden’s pure, piping Eva are a joy. I do not necessarily prefer him to Frantz or Nissen, and Schorr in his prime remains supreme, but his assumption of the role remains treasurable. Karl Dönch’s musical Beckmesser makes a welcome change from the mugging and exaggeration all too common among interpreters who lack confidence in Wagner’s capacity to convey his absurdity in purely musical terms. Knappertsbusch’s conducting is wonderful: energised, pointed and sprung – not a hint of lethargy. The climax of the opera really delivers a punch, as it should, and both the orchestral playing and choral singing are really tight and homogeneous. The impact of the riotous conclusion to Act 2 might be somewhat compromised by the narrow mono sound but is otherwise enormous fun, while the Prelude to Act 3 is as tender as one could wish.